Between 1952 and 1962, when this book was originally published, the number of people visiting British cinemas had fallen by nearly two thirds and was little more than half the pre-war total. 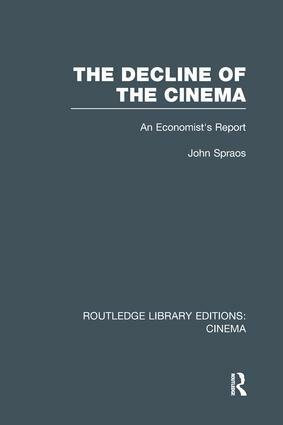 Nearly 1500 of the 4500 cinemas functioning in 1955 had closed five years later, and the author here predicts a further substantial fall. The causes of this drastic decline are traced to the competition of television but also to the dramatic halving of the number of new American films and to the difficulty of transferring a cinema’s ‘congregation’ when it is closed. This decline has few parallels in recent times and in conjunction with a disproportionate and unexpected increase in the price of seats presents a fascinating study for the economist, which the author fully exploits. But the film industry is of general interest so that the author’s conclusions and his social recommendations will appeal to the general reader as well as those in the industry.